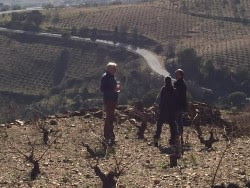 Maldivinas is a partnership between childhood friends Juan Carlos Arenas and Guillermo Fernandez Santos established in 2006 from plots of old vine Garnacha around the town of Cebreros some 50 miles due west of Madrid. This is traditional winemaking territory, where the stunningly beautiful landscape of the Sierra de Gredos mountain range is recognized for the production of balanced Garnacha-based wines in a landscape that is otherwise scorching and dry but with broad diurnal temperature swings that allow for wines to maintain the acidity to balance all that ripe fruit. To get some idea of the altitude here, Cebreros is just east of the Central Mountain System’s highest peak, the slender Almanzor, towering above the landscape at close to 9,000 feet. The organically farmed old-vine wines of Maldivinas express a diverse range of the local granitic and schistous terroirs. These are wines that tend toward Burgundian in texture. They are ethereal, full of pure fruit, and a balanced extraction. While Gredos has already received recognition as a unique wine region, it seems only a matter of time that they will be awarded their own appellation. Widely planted throughout Spain and much of the Mediterranean the Garnacha grape in the right hands and right place has the ability to express the distinct characteristics of the soil and climate where it grows. The 100% Garnacha “La Movida Granito” is a tribute to the decomposing granite soil from an organically cultivated, 4.5 acre vineyard of 90 year old vines at roughly 2,600 feet elevation. The wine is fermented by native yeasts in one concrete tank, with a percentage of whole clusters to highlight the characteristics of the fruit, and then aged in neutral oak barrels before bottling. Aromatically complex with layers of floral, berry, and spice, a sip is juicy and practically begs another in short measure. For a simple yet classically tasty pairing, serve with a big slice of tortilla de patatas. Only 300 cases produced. Although there is very little Albillo Real left in Spain it is the noble white grape of the Sierra de Gredos mountain range. Floral and full of body it is a variety that gains a lot of density from the hot and sunny days in the Gredos summer. “Combate” Albillo Real is 100% old-vine Albillo Real from high altitude vineyards. Its aromas of ripe yellow orchard fruits lead into cool herbality to finish with a lengthy and lively mineral twist. There are no comparisons to this wine but if we were forced we might say that it’s something like the lovechild of a partnership between Burgundy and the Rhône. Only 100 cases produced.